Find all kinds of solar cooking recipes here; from our own recipes to those of others shared by many of our world wide visitors.. Many of the following solar cooking recipes may seem as if they would take longer than the traditional methods of cooking your meals and, admittedly there is some difference in the time required, but as you become more proficient you can shave off more time and effort as you also become more adept at using the solar method of cooking. Also you will soon realize that many of your every day chores, errands and tasks can be performed in between the steps required to put together and cook when using the solar method. 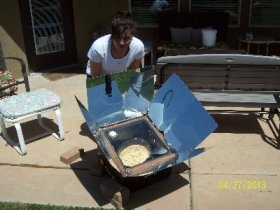 Solar cooking is very similar to slow or Crockpot cooking, and once most of the preparation of the ingredients is finished, it is just a matter of combining the ingredients and then letting the sun do the rest. Some dishes can require more that one or two steps to prepare and in my own personal experience I have not found these to take much more time than the traditional methods of preparation and cooking. Granted solar cooking will work great for a person who is at home more often than not, but that does not mean that the nine to five job guy or gal cannot ever enjoy the benefits of solar cooking. It just means that, instead of solar cooking five to seven days a week like some, they can take advantage on the weekends or holidays and days off. Or better yet, let the housekeeper have all the fun. In all seriousness, I have been able to run two businesses (one in the home and one out) and in between obligations and tasks; have managed to do most of the cooking for our household, and the large majority of it using the solar cookers. Some of the cooking was done traditionally, some on the grill, some in the Dutch oven (briquettes) but a whole lot of it in our solar cookers. When my wife went to visit family for two weeks in June 2008 and I and the four kids used the stovetop/oven only three times during that two week period. The rest of the time we cooked the food with the sun, and it kept the house a whole lot cooler to boot. If you like to cook and are willing to experiment with a solar cooker, you can cook up pretty much anything you can think of, and I can say; you will be pleased with the quality and the results. *We would like to share some of our solar cooking recipes below, along with the steps and methods, used in our solar cooking. I believe it will help to have a bit of explanation and the details of the steps involved in the preparation of each recipe. **Please remember that the time of the year can create variances in prep time, cook time and temperatures. We will try to inform you on the conditions present at the time each recipe was created and cooked so as to give you a basic guideline. This information is offered as general advice on how and when to solar cook, you may find varying results and outcomes depending upon your specific locations and conditions. Solar Cooking Recipes! We want YOUR best and favorite recipes to share with the world! Help us share with others the ingredients, methods, tips and know-how of the best solar cooking recipes you have come up with through your own experiences in this fantastic world of Solar Cooking; Cooking your food naturally. **Note: You can even send us your photos of your favorite dishes. ...Don't have a solar cooker yet? Or would you like to have a manufactured solar oven? ...You can visit our building a solar cooker page or our Solar Cooker Comparisons page or go directly to our Solar Cooker Purchase page and see if there is something there that will fit your alternative energy cooking needs.